If you are in the market for a Windows 8 tablet this festive season for yourself or as a generous gift for a loved one, but don’t fancy a Microsoft Surface slate, you might like to consider the Asus VivoTab Smart Windows 8 tablet. The Asus VivoTab Smart is a 10.1-inch touch screen slate in black with 2GB of RAM along with 64GB of storage and commands a starting price of $499 a pop. Apart from that 10.1-inch 1366 x 758 IPS touch screen, the Asus VivoTab Smart tablet also sports an 8 megapixel rear facing auto-focus camera with LED flash, 1080p video, a 2 megapixel front facing camera, a 1.8GHz Intel Atom Z2760 dual core processor, 802.11b/g/n WiFi, Bluetooth 4.0, Near Field Communication (NFC) functionality, HSPA+ and LTE connectivity, and of course runs the Windows 8 operating system. The Asus VivoTab Smart however does not come with a keyboard dock like its bigger sister slate the Asus VivoTab 11.6 RT, as apparently Asus doesn’t even offer a keyboard dock for the VivoTab Smart, but there is an optional Bluetooth keyboard that is capable of latching onto the tablet and doubles as a screen protector. However what the Asus VivoTab Smart does offer over the RT version of the slate is that the VivoTab Smart can run just about any application that has been designed to run on Windows tablets, whilst although the processor isn’t what one would consider a speed demon, it will run the full Windows 8 OS and both Windows 8 and Windows 7 applications. 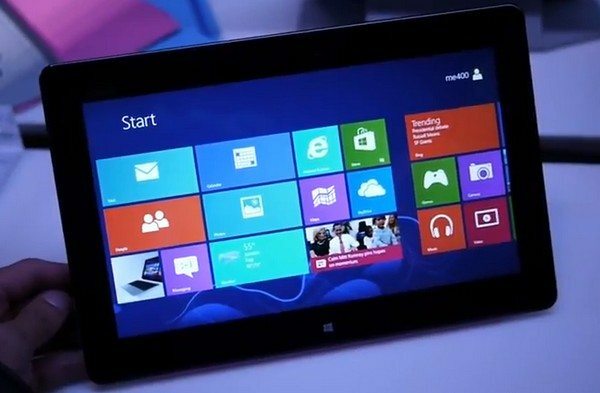 The Windows 8 tablet also offers the customer a microSD card reader, microUSB port, microHDMI port, whilst weighing in at roughly 580 grams and measures 265 x 171 x 9.7mm and sports a battery that Asus claim should last up to 8.5-hours. So with all that now out of the way, if you are interested in picking up the Asus VivoTab Smart then obviously you’d like to know just where you can purchase the Windows 8 slate right? Well there are a couple of places, first potential owners can pre-order the Asus VivoTab Smart from Jr.com, who say the tablet is coming soon, and you also get free shipping for your $499. Whilst if you visit Abt.com the tablet is also up for pre-order for the same price, again with free shipping. However, unfortunately neither say just when the the device will be in stock. Or you can get the Acer Iconia W510, which also runs Windows 8 and is $499 as well. I have one and love it. US buyers can get it online from the Microsoft Store. I’m not sure where to get it in the UK.